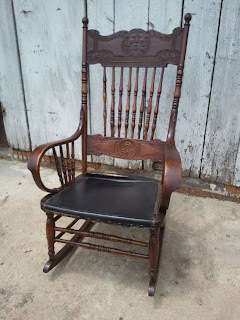 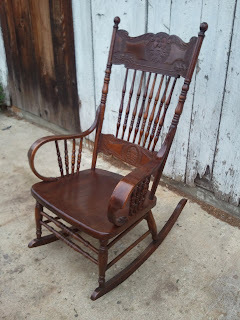 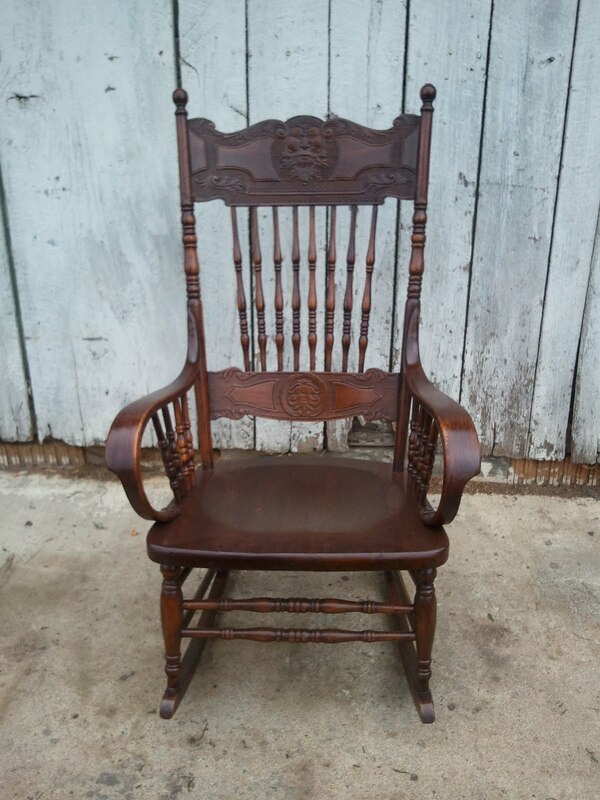 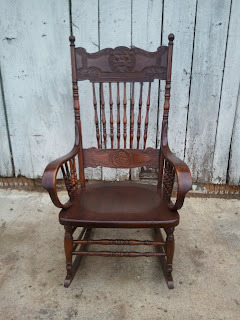 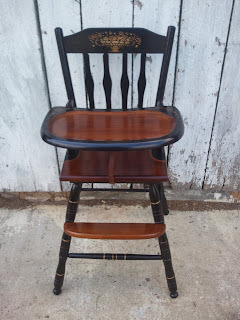 One of the pieces I have recently completed is a pressed back rocking chair made around 1890. The reason I give for this date is that that is when the method of pressing designs (into wood using metal wheels with the design etched in) was first used in a commercial setting. The wheel was forced down on to the wood surface (probably powered by steam) and rolled across the surface of the wood creating the patterns and giving the overall impression of a carved back. The overall design of this chair also seems to be fitting with the turn of the last century. The chair was very loose and had a severe break in the seat of the chair. 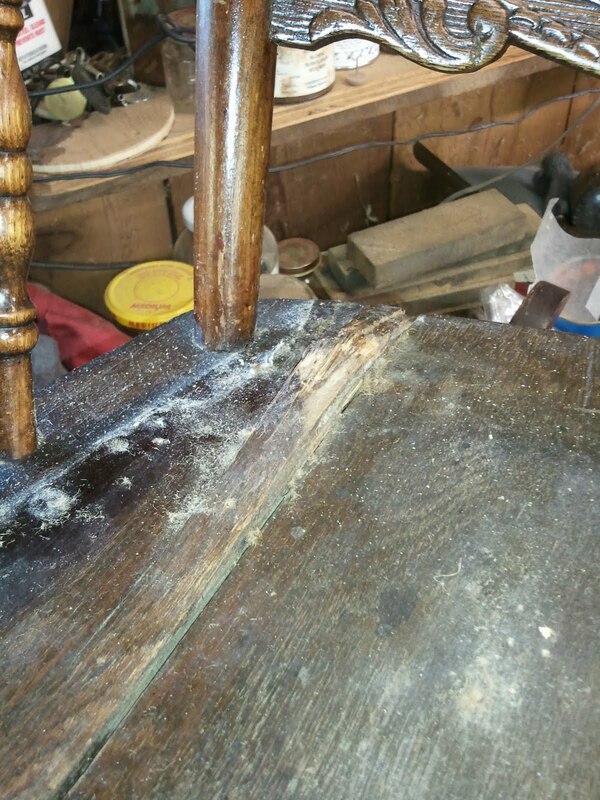 One of the lower back posts had pierced through the seat and was lodged with the tenon poking through. This break happened quite sometime ago, because at one point someone tried to address it with nails and then covered over the seat with naugahyde. The seat subsequently cracked in half and was only held together by braces underneath. 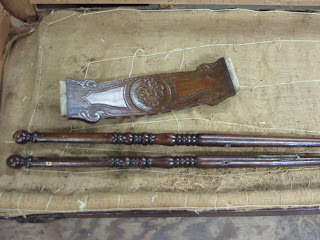 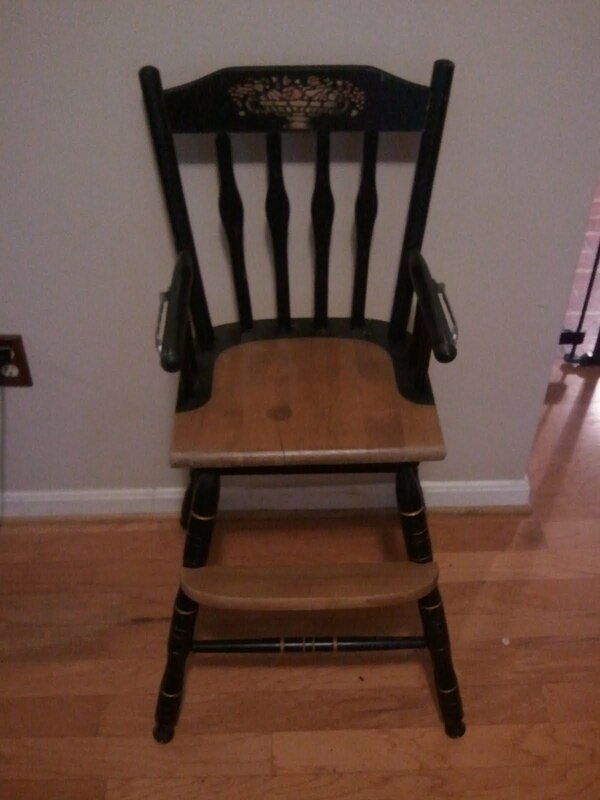 In addition, the chair was held together with nails in all of the joinery. 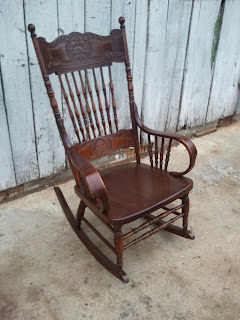 In short, this rocking chair needed some help! 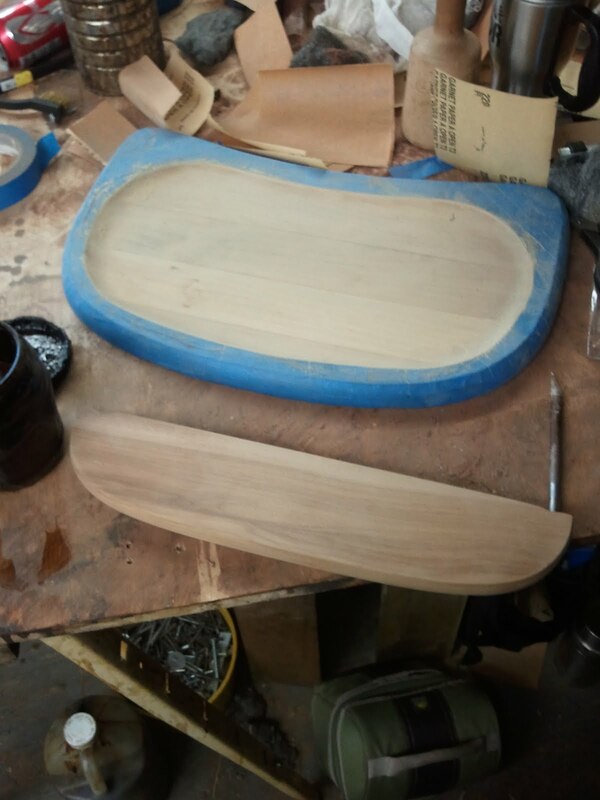 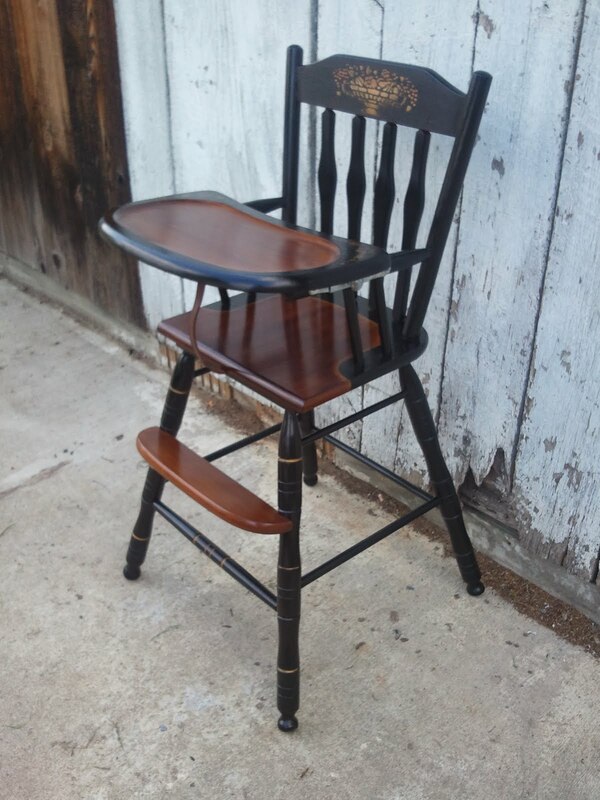 Below are photos of the chair from start to finish. 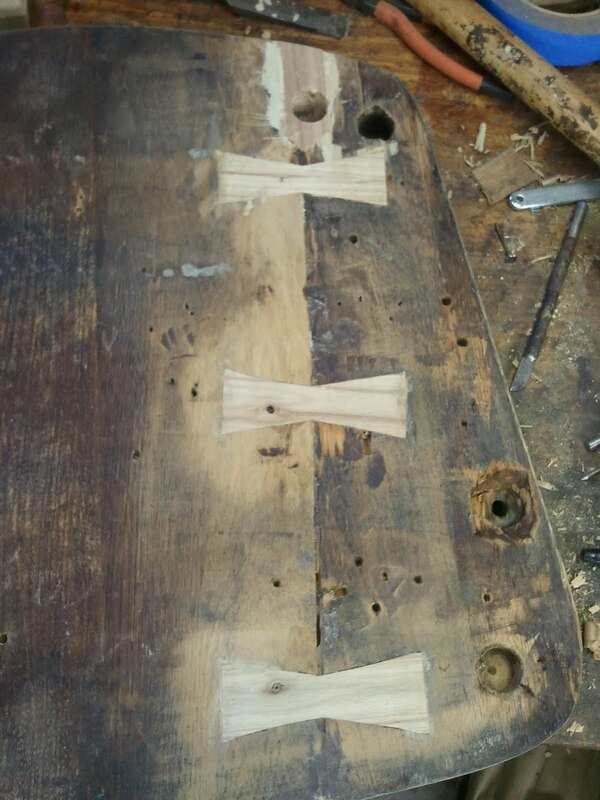 You can see all of the repairs made and the final product. I will start with a photo of the chair as it arrived in my shop. 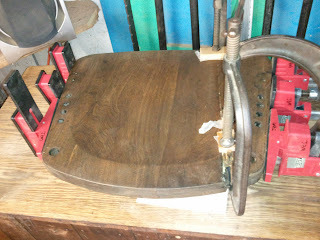 Here is a close up of the seat with the upholstery. 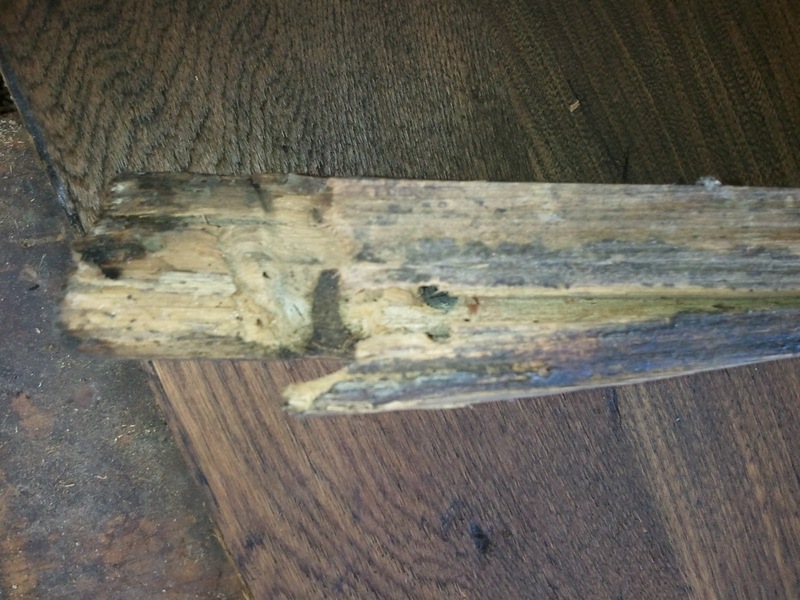 Once the naugahyde was removed, I could see the extent of the damage. 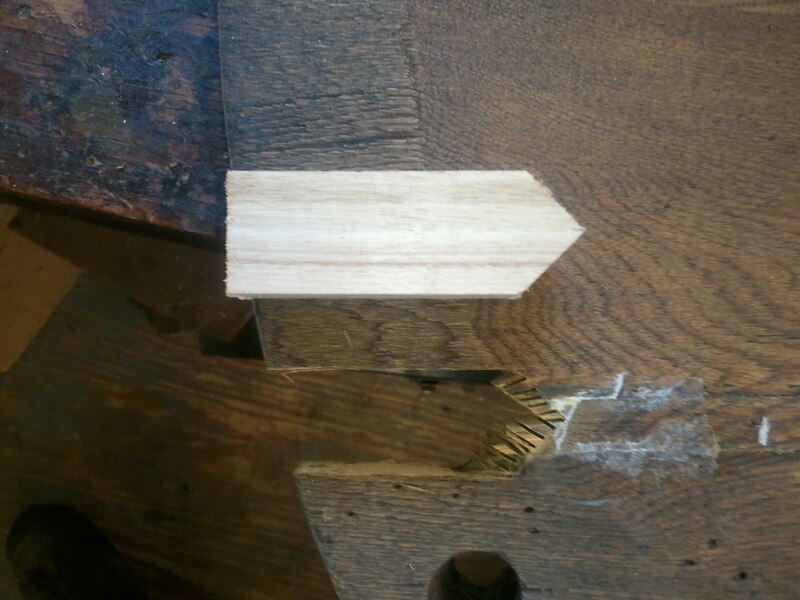 In this photo you can see how the wood was raised by the tenon poking through. 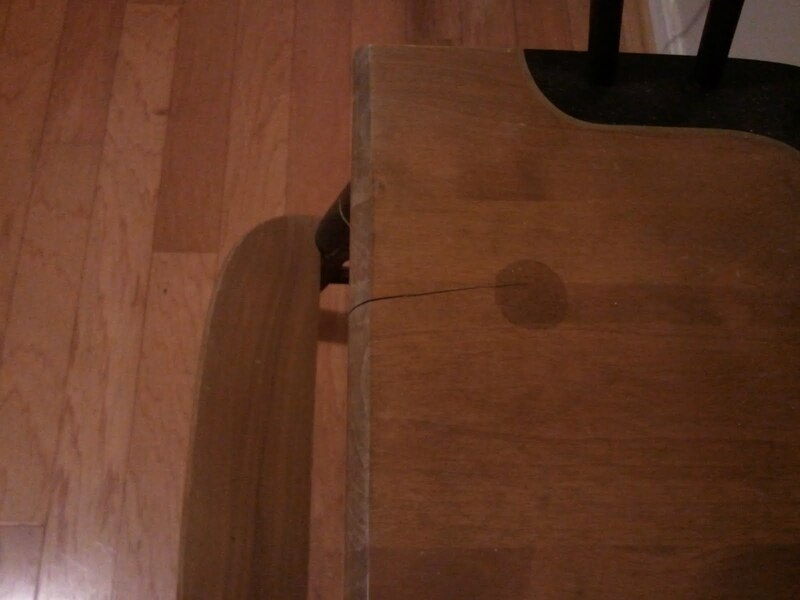 The photo below shows the crack that developed in the entire seat. Once the seat was removed from the rest of the chair I removed the braces that were bracing the seat. 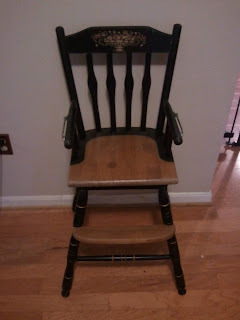 I believe that the smaller brace was original to the chair while the bluish green slat was added as a repair. 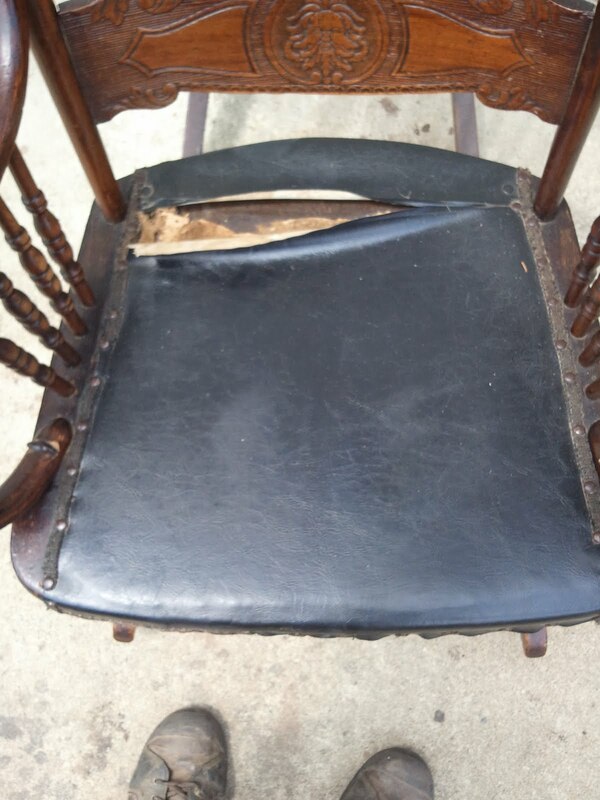 Another view of the damaged seat. 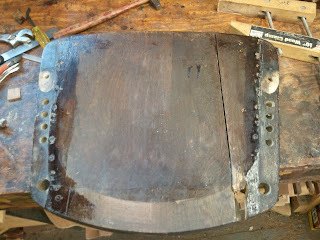 After the braces were removed, I removed the finish from the seat. The crack in the seat was completely separated as seen in the photo below. This was a section of the seat that was completely loose. 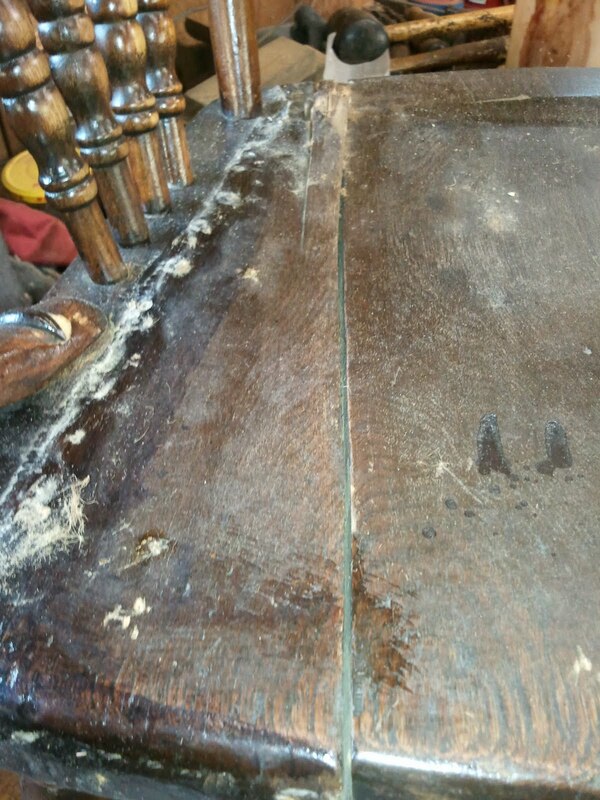 It had been repaired before and had lost some material. 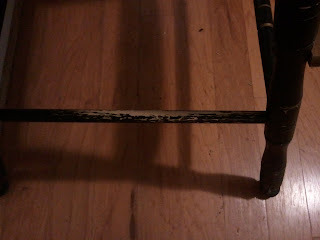 Rather than putting it back in, I made a patch that would span the area. This way there was a tighter surface for gluing up. This photo shows the new patch before it was glued in place. It was later carved flush with the contour of the seat. Here is a photo of the seat being glued up.The patch is also being glued and can be seen in the lower right corner of the photo. 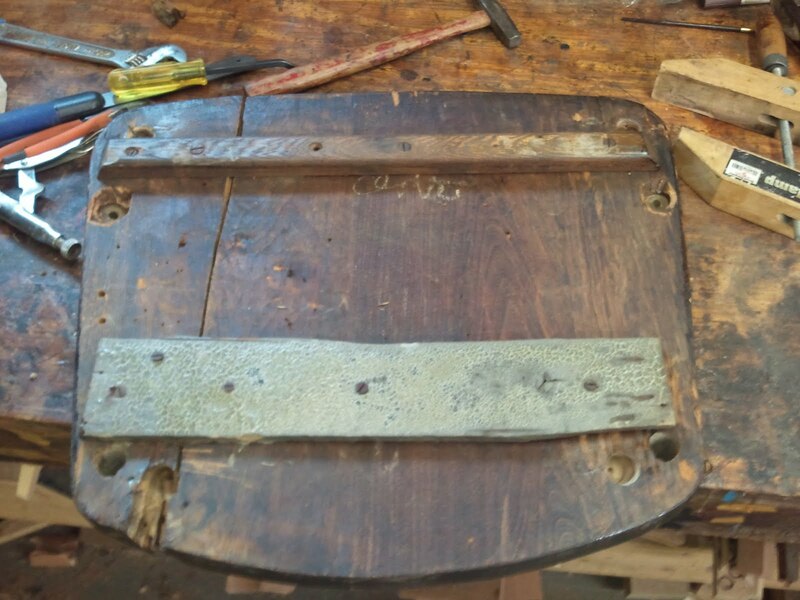 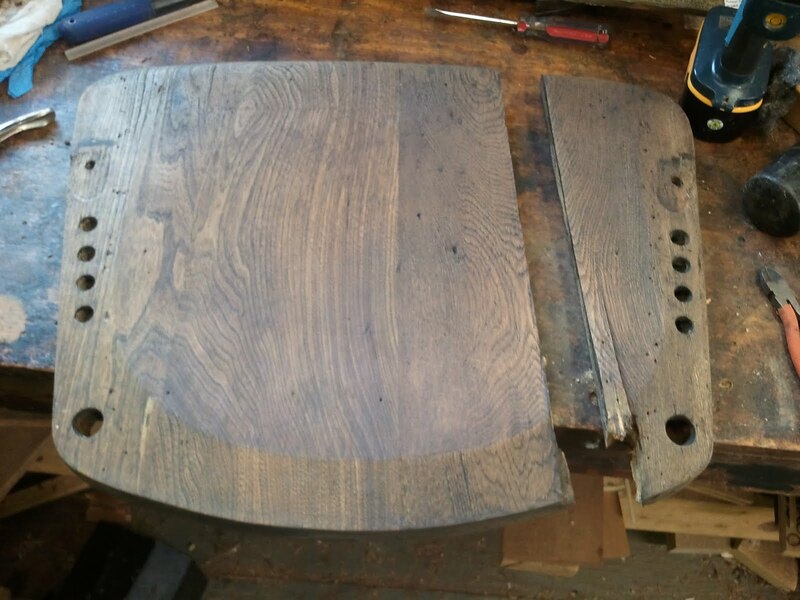 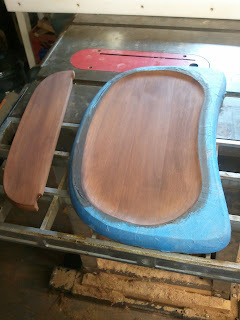 After the seat was glued, I noticed significant wood loos in the underside of the crack that ran the length of the seat. Glue alone would not hold the seat together! I made three butterfly patches that spanned the crack in three spots. 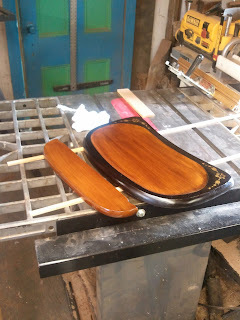 Below is a photo of the patches before they were inserted into the seat. 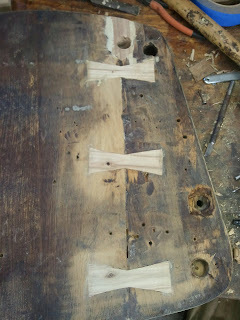 The following photo shows the patches in place and trimmed flush. 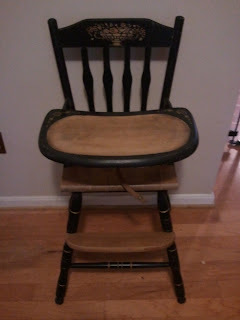 While the glue on the patches was drying, I disassembled the rest of the chair and scraped the joints clean. 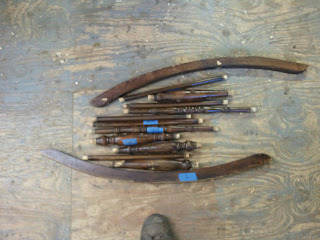 The chair had many nails in it which took a little time to remove, but I eventually got all of the loose joints apart. 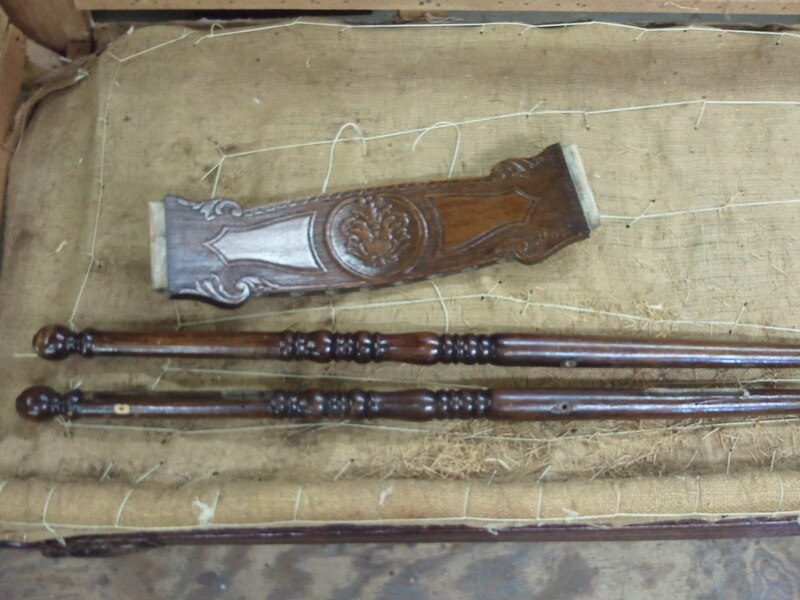 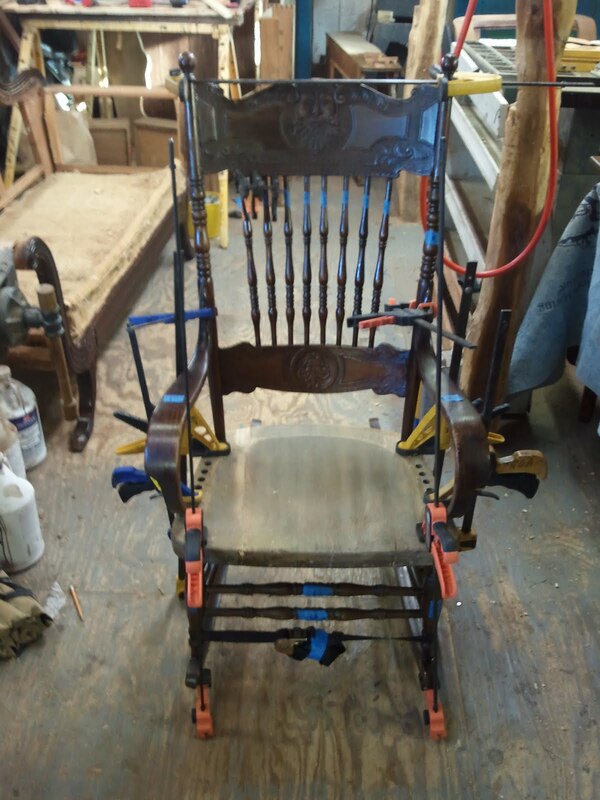 The following two photos show the chair knocked apart. 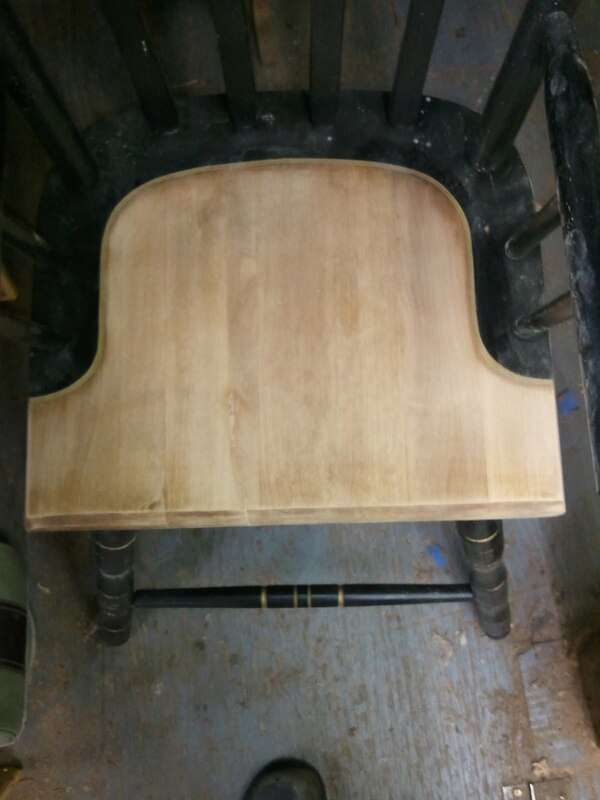 I glued the rocker up with the arms held in place by clamps alone so I knew that everything aligned properly. 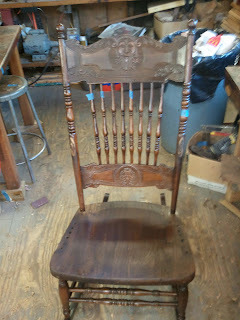 After the glue dried I removed the arms and spindles to make the staining of the seat a little easier. 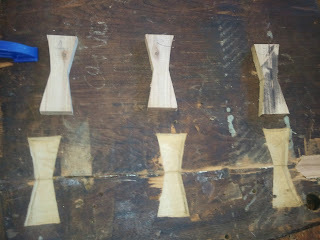 Here is a photo of the chair glued up followed by a photo of the chair with the arms removed and the seat stained. 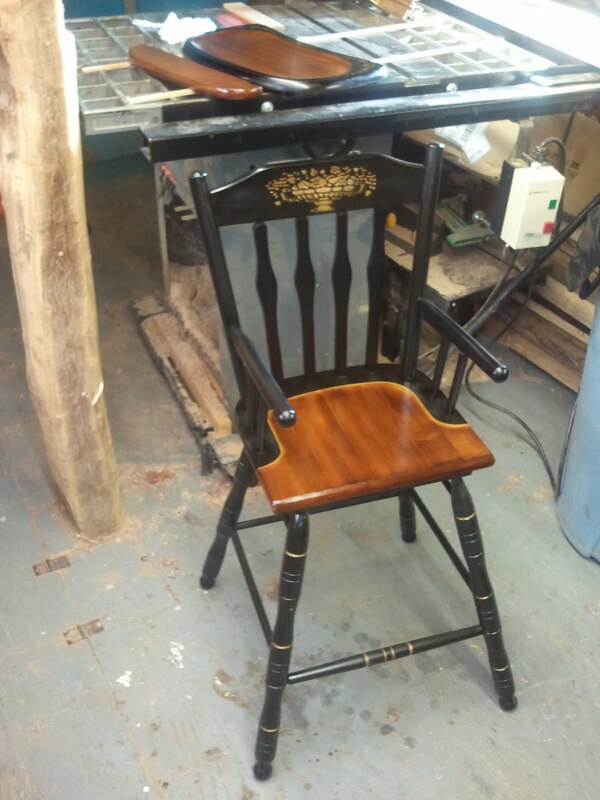 After the seat was stained, the last thing to do was to build up the finish on the seat and clean and add finish to the rest of the chair. 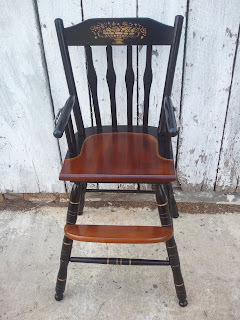 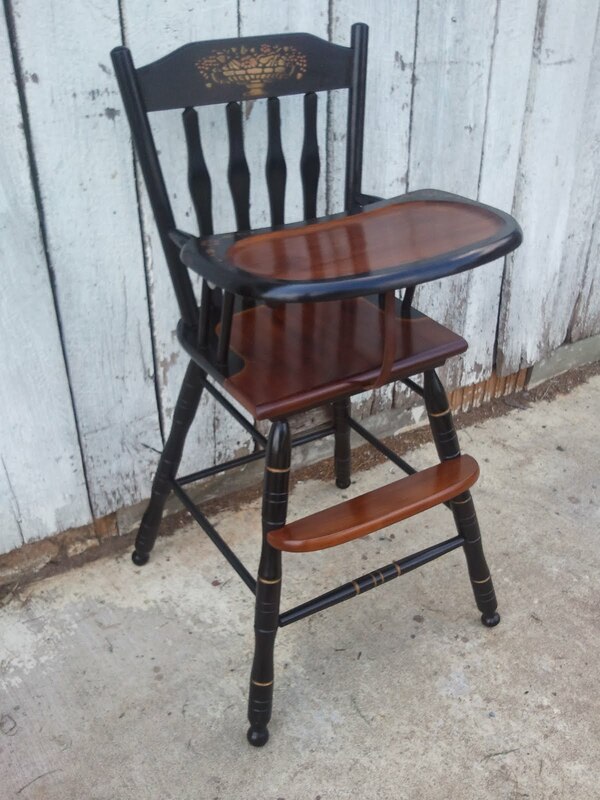 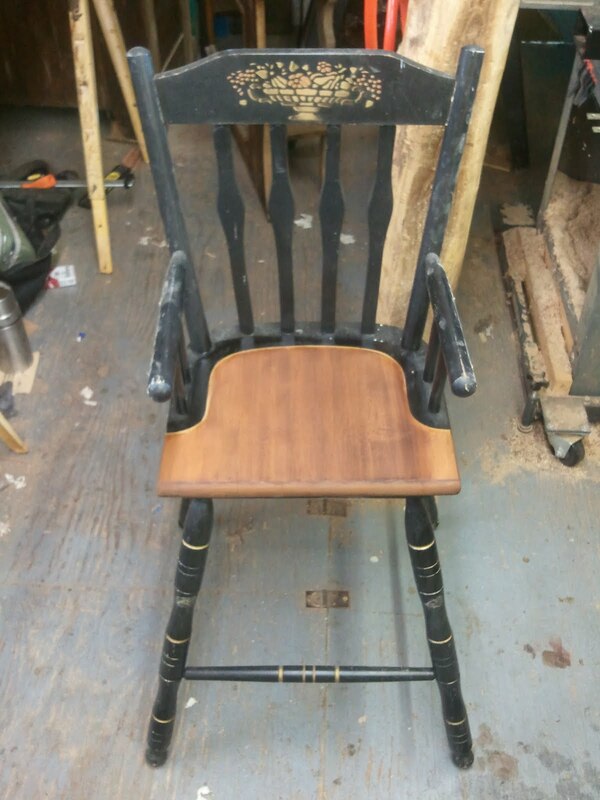 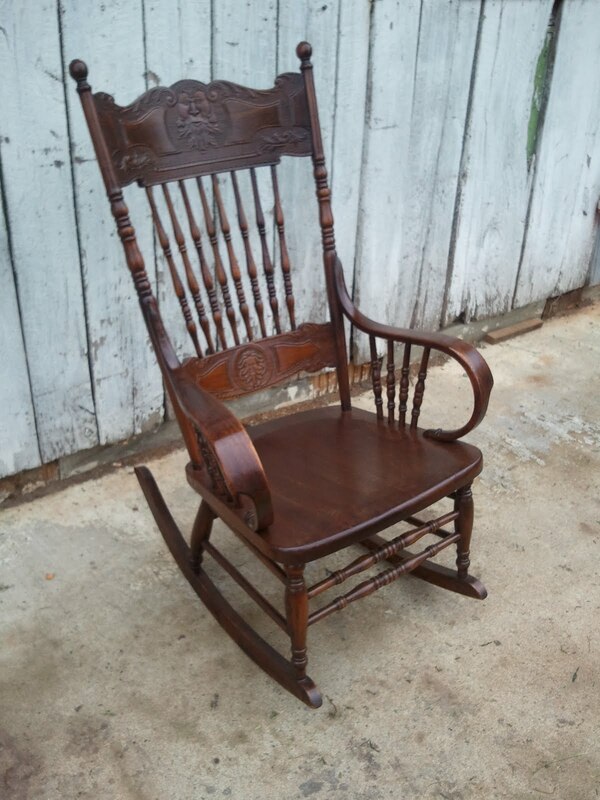 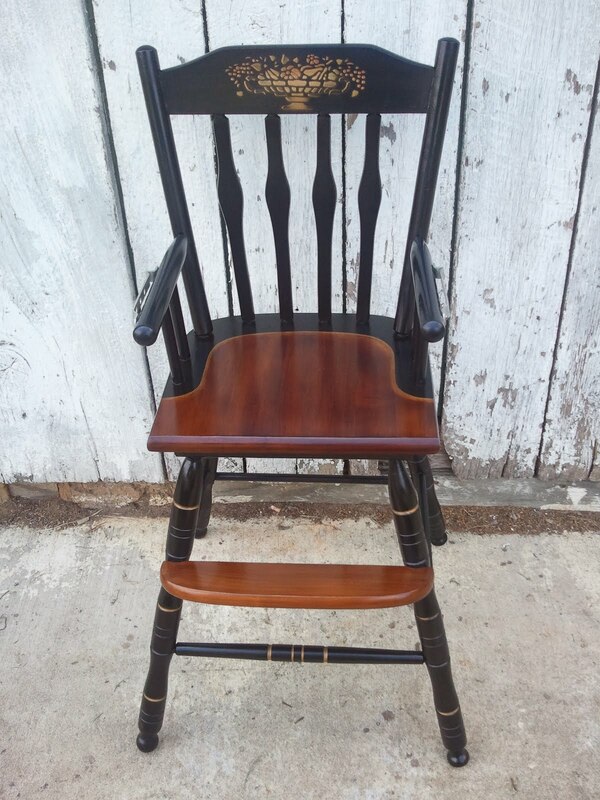 The results can be seen in the three photos of the completed rocking chair.